Food intolerance testing is important if you want to overcome food sensitivity and allergies getting an accurate diagnosis is vital. Once you know which foods you are sensitive to and exactly what kind of adverse reaction you experience when you eat those foods you can treat the condition effectively. Without an accurate diagnosis it is all too easy to end up going down the wrong path. You can easily end up cutting out the wrong foods and taking ineffective supplements or medications. To help you to avoid this I have put together this comprehensive guide to food allergy testing. Here I explain how each type of food sensitivity is diagnosed. This is just an overview of the different types of tests. If there is a specific test you would like to know more about you can do so by drilling down in this section and reading the individual article for that particular food intolerance test. These tests are also called scratch tests. The way it works is that a drop of liquid containing distilled elements of different foods is dropped onto the forearm. What is in the liquid is normally written on the arm under the drop. 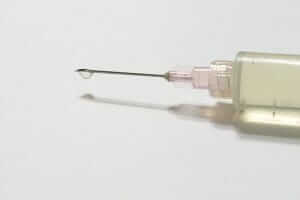 The practitioner carrying out the test then takes a needle and scratches the skin below the drop of liquid. If the skin in that area swells, there is a good chance that you are intolerant of that food. It can take up to 30 minutes for the reaction to appear. There are limitations with this test, but it is still widely used and has, over decades, proved to be an important tool in helping people to get a diagnosis for their food intolerances or allergies. It is a test that is used in most countries. This is one of the oldest forms of food allergy testing out there. It is also one of the most reliable. This test works on the same principle as the skin prick test. However, with intradermal progressive dilution testing the compound is injected just under the skin rather than dropped onto the skin. Some allergists use this under the skin testing when they see only a mild reaction to a scratch test. Because the compound goes under the skin rather than just onto the skin, the suspected allergen comes into contact with more of the cells involved in your body’s immune reaction. This usually prompts a more marked reaction, which clearly demonstrates an allergic reaction to that food. Another version of looking for reactions on the skin to certain foods is the patch test. With this method, a solution of the suspected allergen is taped to the skin and left there for between 24 and 72 hours. This method is rarely used to diagnose food hypersensitivity, but if someone is afraid of needles, it may be a way of narrowing down at least some of their food allergies. These are also commonly used for food allergy testing, but new studies are casting doubt on their accuracy. Some now believe that they are not always conclusive. Nevertheless, many allergists still use them, but nowadays as part of a panel of tests. If a food allergy or intolerance is suspected it is possible to use diet as a diagnostic tool. The way it works is that the suspected allergens are eliminated from the diet. This is another food intolerance testing gold standard that has a long history and proven track record. If the symptoms go away, the conclusion is that the food that has been eliminated is responsible for the person’s symptoms. It is a simple idea that works really well and was, prior to the development of blood and skin tests, the prime way food allergies or intolerance was diagnosed. There are several different elimination diets available. Below are the names of the most popular ones. They all follow the same diagnostic principle, but they are all slightly different. Here are the most popular food intolerance testing diets. If you want to find more information about each of these diets, you can find out more in the detailed posts about elimination diets in the treatment section. There is detailed advice about each diet along with links to resources to help you to follow these diets and get a handle on which foods are making you ill as soon as possible. Food challenge testing is usually done to work out whether someone is still intolerant of or allergic to a specific food. This kind of food intolerance testing is often carried out on children to work out whether they have grown out of a food allergy. Because the test is normally done on people who are actually allergic to foods rather than just intolerant of them it is normally carried out in a hospital setting. This is because any adverse reaction could be potentially severe. In people with potential food intolerance challenge tests are normally only carried out as a way to confirm a diagnosis that is not clear cut. The right type of food intolerance testing can potentially take several hours to carry out. A food product is given to the patient and symptoms or a reaction are looked for. If no reaction occurs after 30 minutes a new food is tested. The food is disguised to avoid a psychological reaction to the food. This test falls into the category or alternative food sensitivity tests, so I was not sure whether to include it on the site. However, it was an ex GP and chemist who used this kind of testing that filled in some of the blanks for me and a relative that allowed us to finally hone in on which foods were making us sick. Once we followed the diet she recommended we both gradually improved. My uncle still had lots of problems with eating various foods, but the treatment Dr Mary Loveday offered him made a very positive difference to his life. She helped him a lot. So, despite the fact lots of people get really angry with me for including this option on this site, it would be remiss of me not to tell you about it. I want you to have all of the options in front of you. It is the best way to allow you to make an informed decision. Therefore, I am including alternative tests and treatments for food intolerance on this site. However, you need to know that there is quite a bit of bad press around the use of these machines and kenetic testing techniques. My experience was good, but bear in mind it was a medically trained chemist doing the tests in my case, and she already had a decades worth of experience and a good reputation by the time I saw her. Before spending money on this type of treatment, please do some extra research. It is important to be sure it is for you, and for you to bear in mind that it is not a medically recognised form of treatment. Nor, as far as I know, has there been any properly certified research done into how effective it is. It is claimed that a Vega machine can measure the flow of energy between two acupuncture points. Non invasive probes are placed on two linked acupuncture points and the flow of energy is measured by the machine. Once a base line has been established a small vile containing a highly concentrated food sample in liquid form is introduced into the circuit. If the amount of energy flowing between the two points drops away you are probably intolerant of that particular food. This form of bio-electrical testing, which is sometimes also called EAV or electronic testing. © Andresr | Dreamstime Stock Photosparticular food. This form of bio-electrical testing, which is sometimes also called EAV or electronic testing. Applied kinesiology is different from pure kinesiology which is the study of human movement. Pure kinesiology is used to diagnose movement issues in the fields of sport psychology, orthopaedics< and rehabilitation. There is a connection between the two fields, but it is a tenuous one. There is a lot of scepticism surrounding this emerging field of Applied Kinesiology, but again it is something you should know about. Here is how it works. Muscle strength and weakness is measured when a suspect food is present and when it is not present. If strength is diminished when a food is under the tongue or placed in drop form on the tongue those foods should be considered as irritants and should be avoided. The Kymatika test (K Test) involves someone placing there hand on a device, which bombards the body with different electrical sequences. The bodies reaction to those sequences is measured or mapped. That map is then interpreted to determine which foods that person should avoid. This form of food intolerance testing has also had some bad press, but it is available, so you need to know about it and if you are interested can do more research. This is another form of energy testing, which unsurprisingly has been slated. The way it works is that you pull out a few strands of your hair and send it up for testing. Your hair is put into a machine, which measures the strength of energy currents that are passed through it. The results are then interpreted to determine which foods you should be avoiding. This is another unproven form of food intolerance testing which is sometimes called pulse testing. The resting pulse is taken. Then filter papers soaked in allergens are placed on the forearm if the pulse quickens that is an indication of an adverse reaction to that particular allergen. Testing saliva for the presence of antibodies is the latest way to test for food sensitivity. Again, it is not a tried and tested diagnostic tool. Most practitioners do not offer this type of food allergy testing. This test which is also known as Bryan’s Test is a form of blood testing, but it is not used in mainstream medicine, so I have listed it under this section. The patients white blood cells are mixed with the suspected allergen. How much the leukocytes swell is measured. This test is not used by many medical practitioners. However, some studies have shown a correlation between the results of a Bryan test with those of some standard allergy tests. That said, no large studies have been carried out. In addition, this test only works if results are carefully analysed. The quality of the home allergy testing kits varies greatly. Some are very good others give questionable results. Even with the good food intolerance, testing kits it is all too easy to misinterpret the results and draw the wrong conclusions. For these reasons, if you can get help from an experienced professional to accurately diagnose your food intolerance. I do cover home testing kits for food allergies and intolerance, but I only do so because I know in some countries the cost of professional help is prohibitive for some people. In others the waiting list can be up to a year long. Therefore, I provide information about home testing because I think it is important to provide readers of this website with alternatives, and the best alternatives are currently home testing kits of food sensitivities. SAFETY WARNING – if you have a full blown food allergy using this form of food allergy testing could result in death. You really have to be careful with testing allergies at home. There is always the risk you can go into full anaphylactic shock. Some of these tests are available from local chemists and health food shops. However, because of the danger of someone having a life-threatening reaction to the test they are not recommended. Some countries do allow chemists to carry out these tests, but in other places they are banned. Whether you take advantage of these tests or not is very much a personal decision. If you do not have access to a medical professional to help you to diagnose your food sensitivities these tests may be a reasonable option. However, you have to check how the results are produced. You do not want to be paying high fees for food allergy testing that works in basically the same way as a home food intolerance testing kit for intolerance does. Also bear in mind that you may be left having to interpret the results yourself. However, these tests are worth investigating and considering. If you have not yet sought medical advice about your condition my advice is that you do so as soon as you can. Food intolerance and allergies have a cumulative effect on your health so you want medical support if it is available. Professional food intolerance testing is the fastest way to get to the bottom of your food sensitivity issues.